Sapa is a small town in the Northwest of Vietnam and about 38 km from Lao Cai city and 376 km from Hanoi Old Quarter. It takes about 8 hours by train from Hanoi to Lao Cai station and 1 more hour by car to Sapa. Sapa has temperate and subtropical climate which make it comfortable weather all year round. It can be seen four seasons within a day here: spring in the morning, summer at noon, autumn in the afternoon and winter in the evening. Average temperature is 15 °C. In the summer, the town is less hot than other areas in the North at temperature from 20 °C – 25 °C for day time and about 13 °C – 15 °C for night time. The winter here, on the other hand, is colder than other areas, the temperature even goes down to 0°C; there’s snow and freezed rain drops sometimes. This type of weather makes Sapa become a winter highlight for domestic tourists. Sapa was discovered by French in 1903 and established as a “summer leisure paradise” from 1920 when the railway from Hanoi to Lao Cai was set. About 300 summer villas were built at that time, but after wars, the majority of buildings were ruined. In 1990s, Sapa was reinforced to serve as a tourist destination and many types of accommodation and tourism services were … Sapa nowadays attracts hundred thousands of domestic and international tourists. Because of increasing tourism development in Sapa, it is easy for tourists to take tours to visit its popular tourist attractions from travel agents or themselves by hiring motorbike and local guide. Tourism services are quite adequate and easy to reach. Sapa is comprised of many natural attractions and landscape magnificent. Among of those is Thac Bac (Silver Waterfall), which is about 200 m high and the headwater of Muong Hoa River. Above this river is Cau May (Cloudy Bridge), which can be reached from a small path about 3km from main road. Standing on the bridge, tourists can feel like floating on the cloud because of water evaporating from the Muong Hoa river. Also in Muong Hoa Valley, there’s an ancient Stone Garden where contains hundreds of engraved stones with many different patterns of human activities, roads, staircase, handwriting, etc. These patterns are still mysterious about their meaning, yet prove the existence of ancient people and rich culture of this place. Heading towards more 2 km, tourists can reach the Heaven Gate - the only spot can be reached by a built road to open a view to Fansipan Mount and to the rice field valley. Ham Rong is a historic site and emplaced with many plants and flowers, especially many endemic orchids. Fansipan Mountain has 3,143m in height and belongs to Hoang Lien Son Range. Hiking on the peak of the mountain has become an adventure tour that attracts many young people. It’s not only about sightseeing the beauty of the landscape but also about experience to conquer the roof top of the Indochina. Hoang Lien Son itself is also a natural treasure of Sapa as it is the habitat for many endemic species of fauna and flora, 37 species of fauna among them were recorded in Vietnam Red Book for strict preservation. Ancient Cathedral of Sapa is another popular tourist spot within the town. The cathedral was built at the beginning of 20th century and built entirely from stones. The architecture was inspired by Gothic style and completed with sophisticated construction techniques. It has become the religion center and a symbol of the town. Last but not least, the distinctive trait of Sapa perhaps goes to the minority ethnic groups with their unique costumes and distinguished traditions. The local festivals and market best describe these characteristics. Mong people have “Sai San” (Opening Season) Festival, held in the beginning of the year, on January of Lunar Year; this festival is celebrated with many Mong’s folk games and folk music performance. Giay people’s “Roong Poc” is celebrated to aspire for fruitful harvest and harmonious weather for cultivation. “Tet nhay” (Dancing Festival) of Dzao people is also a special treatment to those who are interested in discovering ethnic culture. Sapa is also well-known for Cho Tinh (Love Market), a place for ethnic people to socialize and seek for their perfect match. It is organized only on Saturday night and has become a typical trait of this small town. 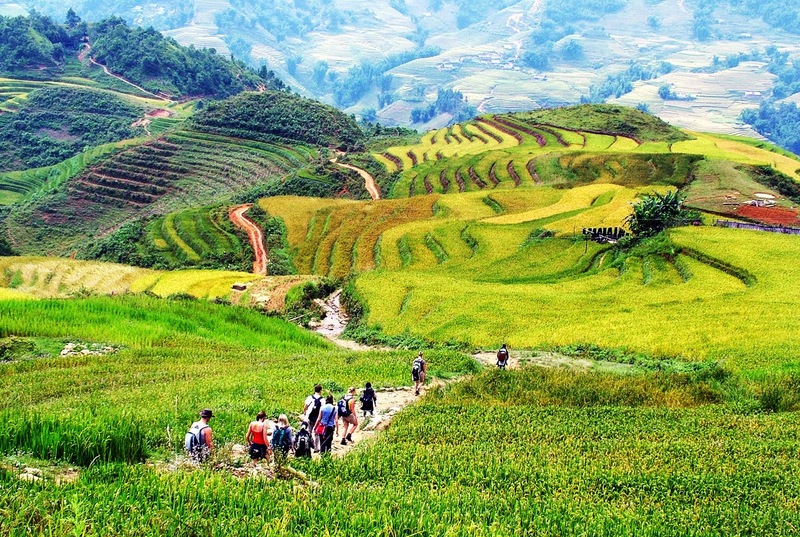 Trekking tours are usually organized to some ethnic communities to visit these people including trekking through Giang Ta Chai village of Red Dzao, Cat Cat, Sin Chai village of Mong, Ta Van village of Giay people. Furthermore, because of its comfortable climate, Sapa is a paradise of subtropical fruits, flowers, vegetables and other agricultural products. Especially, peach, plum, roses, salmon, sturgeon are the specialties of this productive land. In spring time, the blossom of wild cherry, plum-trees and flowers which become a picturesque scene will definitely fascinates anyone coming here.